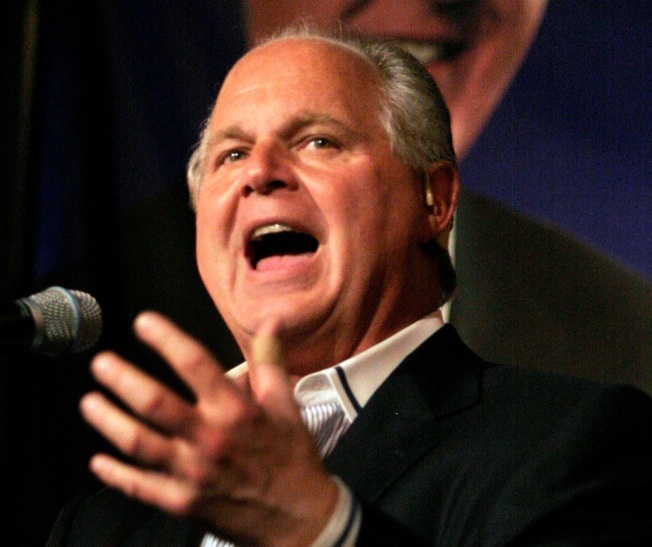 "They hate me, so they're happy I'm not coming back," Limbaugh said, and for once, we all agreed with him. Hey, New York, you won't have Rush Limbaugh's fat head to kick around anymore. Many a New Yorker's prayer has been answered. The right-wing blowhard declared on his talk show yesterday that he was leaving the city and not coming back. He'll try to sell his apartment and not darken our doorsteps any longer. New York collectively flicked its fingers off its chin and said, "Well, don't let the door hit you on the way out." The rant started with Limbaugh addressing, of course, the state's announcement that taxes for those making over $500,000 would go up and went on to lament that "achievers" — and he says this the way Jeffery Lebowski would (not the Dude, the "other" Jeffery Lebowski) — were being punished. The full transcript of red-faced Rush's tirade is over at Huffington Post, but it basically amounted to — besides calling New York "the liberal capital of the world" — an economics lesson that would have made sense to a robber baron during the industrial revolution. So hopefully the last chunk of change Limbaugh will drop in state coffers will be from the sale of his condo.